BSNL, the Broadband Market leader, has announced two new Unlimited Broadband plans for its Postpaid Broadband subscribers in Chennai. 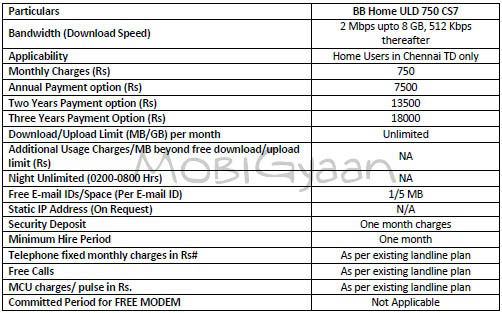 The two new Unlimited Broadband plans are BB Home ULD 750 CS7 and BB Home ULD 900 CS8. 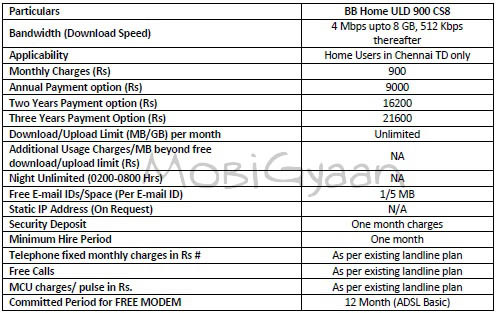 The BB Home ULD 750 CS7 offer Unlimited data download/upload at a speed of 2 Mbps upto 8 GB and 512 Kbps there after. It comes with monthy, annual, two years and three years payment option. These plans are available till 24th February 2012.